Formerly known as the Warren County Airport, the Floyd Bennett Memorial Airport has been serving Queensbury, NY and the surrounding area since the early 1940s. The airport was built in 1941, during World War II. Though the U.S. had not entered the war at that point, there was still concern that the country might be invaded from the Atlantic, and this lead to the building of the Warren County Airport for strategic purposes. The airport was renamed in 1998 and dedicated to Floyd Bennett, the pilot of Admiral Byrd's famous first ever flight over the North Pole. Floyd Bennett was a Warrensburg, NY native, who was born, grew up, and went to school there. For his achievements, Bennett was awarded the Medal of Honor. He is interned in the Arlington National Cemetary. Press in Europe was skeptical of the flight, because it took off and returned on the same day. Later, sextant readings in Byrd's flight diary revealed that the men could not have possibly reached the North Pole at all. However, Bennett's piloting was still admirable - he managed to keep plane and crew safe despite a threatening oil line break. Today the airport can see everything from a Piper Club (small, light aircraft) to a C-5 Galaxy (one of the largest military airplanes), even F-16s. In September the Adirondack Balloon Fest brings hundreds of hot air ballons to take off from the fields. In between all the star wings and balloons, passenger flights and other types of planes find it easy to land at this Queensbury airport. 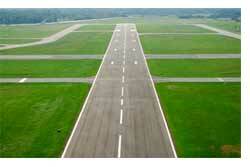 Part of this ease is due to a precision instrument landing system, which most airports of comparable size do not have. It makes some difficult landings, like low cloud cover, more possible and safe. Tucked in an enviable position near Albany International, JFK, Montreal, and Boston, the Floyd Bennett Memorial Airport is an unassuming but important part of Queensbury, NY.